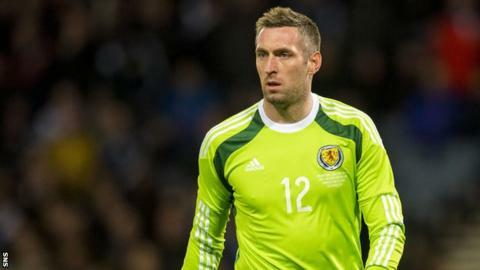 Manager Gordon Strachan believes Allan McGregor's decision to miss next month's double-header against Qatar and the Republic of Ireland will work to Hull City's and Scotland's advantage. The City keeper is resting a long-term injury and Strachan has replaced him by bringing Dundee's 23-year-old Scott Bain into the squad for the first time. Strachan said: "He's been brilliant for us, we can only respect his decision. "It'll be a benefit for Hull and a benefit for us in the long term." Speaking at Easter Road, the venue for the friendly against Qatar on Friday 5 June, the manager added: "Allan's got a problem that we've known for a year, he's been playing with an injury, and the club and himself want time for that to calm down." Bain is up against experienced duo Craig Gordon, of Celtic, and Cardiff's Gordon Marshall for a place in the team, but his inclusion is more likely with an eye on the longer term. "(Scotland goalkeeping coach) Jim Stewart's been impressed with him. He believes he's a player for the future," said the manager. Bain came through the ranks at Aberdeen but it was at Alloa, where he was signed by Paul Hartley in 2011, that he began to impress. Hartley then signed him again when he took over at Dens Park and his form helped the Dark Blues finish in the top six in the Scottish Premiership this season. After the Qatar match Scotland travel to Dublin for the Euro 2016 qualifier against Martin O'Neill's Republic of Ireland side on 13 June. Also in the 26-man squad are Stoke City midfielder Charlie Adam and Celtic striker Leigh Griffiths, both in impressive form of late. Strachan has also included Celtic's versatile Charlie Mulgrew, who returned from a five-month injury lay-off on Friday against St Johnstone. "He's back in the Celtic side and I don't think they'd put him in if he wasn't right," Strachan said. "Charlie was a huge asset for us last time we played the Republic, he had a terrific game. Having Charlie in the squad makes us stronger." Aberdeen defender Mark Reynolds has featured in previous Scotland squads but has yet to win his first cap. Griffiths has scored 13 goals to help Celtic win the Premiership and has added six in other competitions this term, all but four of them coming in 2015. Shaun Maloney, who scored Scotland's winner against the Irish at Celtic Park in November, is included in the squad's group of midfielders, along with West Brom pair Darren Fletcher and James Morrison. Adam has not featured for his country since the Warsaw friendly with Poland in March last year. Last week he told BBC Scotland that he hoped his goalscoring form for Stoke would be enough to win a return to the international set-up. Scotland and Germany are level on 10 points from five qualifying games so far, both one point behind Group D leaders Poland. The Republic of Ireland are on eight points. Goalkeepers: Scott Bain (Dundee), Craig Gordon (Celtic): David Marshall (Cardiff City). Defenders: Christophe Berra (Ipswich Town), Craig Forsyth (Derby County), Gordon Greer (Brighton & Hove Albion), Alan Hutton (Aston Villa), Russell Martin (Norwich City), Charlie Mulgrew (Celtic), Mark Reynolds (Aberdeen), Andrew Robertson (Hull City), Steven Whittaker (Norwich City). Midfielders: Charlie Adam (Stoke City), Ikechi Anya (Watford), Barry Bannan (Crystal Palace), Scott Brown (Celtic), Darren Fletcher (West Bromwich Albion), James Forrest (Celtic), Shaun Maloney (Chicago Fire), James Morrison (West Bromwich Albion), James McArthur (Crystal Palace), Matt Ritchie (Bournemouth). Forwards: Steven Fletcher (Sunderland), Leigh Griffiths (Celtic), Steven Naismith (Everton), Johnny Russell (Derby County).